Philadelphia Police have released the 911 call and dispatches made before and after the arrest of two black men at a Center City Starbucks that sparked several protests and outrage nationwide. The first call was made by a manager at the Starbucks on 18th and Spruce streets Thursday at 4:37 p.m.
“Alright, police will be out as soon as possible,” the dispatcher replies. Police also revealed the response timeline. At 4:40 p.m., the officers were dispatched. At 4:41 p.m., the officers arrived at the Starbucks. At 4:44 p.m., the officers requested backup and a supervisor, claiming a “group of males” inside the store were causing a disturbance. At 4:45 p.m., dispatch checked on the officers and sent additional backup. At 4:57 p.m., officers requested report numbers for the two arrests that were made. Finally, at 5 p.m., officers were en route to police headquarters with the two men. 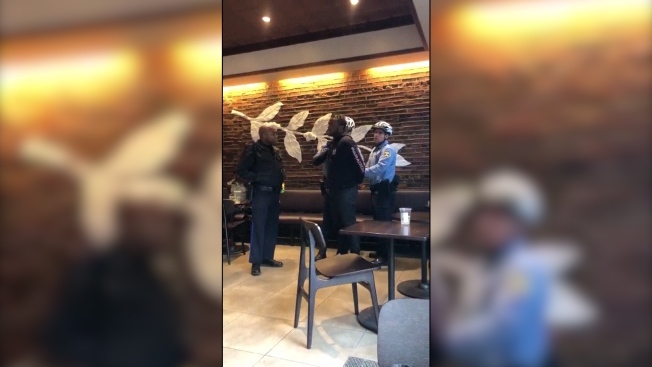 The men were arrested by as many as seven Philadelphia police officers Thursday afternoon while waiting for another person to arrive at the Starbucks at 1801 Spruce Street. The store manager called police on them after they asked to use the bathroom, were denied because they hadn't bought anything, then sat at a table. That other person they were waiting for, Andrew Yaffe, who works in real estate in Philadelphia, arrived as the two men were being hauled off in handcuffs. They were released hours later without being charged. Starbucks declined to press trespassing charges. Yaffe has not responded to requests by NBC10 to discuss the incident. Protests followed in the days since the arrests, which were caught on video. Calls to boycott the chain of 28,000 stores across the world included messages like "Starbucks coffee is anti-black." Starbucks CEO Kevin Johnson called the incident "reprehensible" and also met with the two men, who have not been identified. The men also met with Mayor Jim Kenney and Police Commissioner Richard Ross. The two men's attorney, Stewart Cohen, read a joint statement from the two men and the Starbucks officials Tuesday afternoon at his Center City office. Cohen declined to take questions. "For the past several days, Starbucks CEO Kevin Johnson and my clients, the gentlemen involved in the incident at Starbucks that led to their arrest, have been engaged in constructive discussions about this issue as well as what’s happening in communities across the country. Mr. Johnson apologized on behalf of Starbucks. And the conversation continues today about how this painful incident can become a vehicle for positive social change. And the people at the center of this have come together, with civility common, purpose and a willingness to listen to one another and work towards a solution. Together we ask that the community respect this process. There will be more to follow." Starbucks plans to close all of its more than 8,000 US stores on May 29 for racial bias training in light of the incident.